Our Membership Boats continue to be at our Bay Point Marina location on C Dock. Electronic Gift Certificates – now available! Book online now! SailTime is conveniently located to serve Norfolk, Richmond, Williamsburg, Virginia Beach, Portsmouth, Newport News, Hampton Roads, the southern Chesapeake Bay, North Carolina, and Virginia. 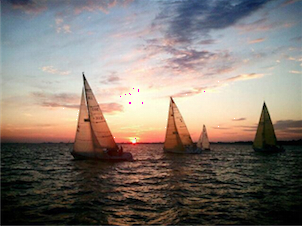 Our sailing school is located at Vinings Landing Marina, 8166 Shore Drive, Norfolk, VA 23518. We are an American Sailing Association (ASA) Certified sailing school offering the full line of ASA courses, plus Intro to sailing, discover sails and captained charters. Our fractional sailboats are located at Bay Point Marina “C” dock, on Little Creek – slips C47 and C49. SailTime Virginia Beach offers Crew Time, Classic and Lite membership levels. With SailTime’s ownership program, you own your boat, we take care of the professional management and generate a revenue stream to use toward your expenses, while you enjoy your time sailing. We are looking for new Beneteau Sailboat Owners. If you are considering buying a boat, call Kristen at 757-663-7245 today to find out about this great opportunity to get out on the water! Discover Sails only $199 on our 22′ sailboats. We also offer Captained Charters and Sunset Sails on our 36′ sailboats. Join us on the water to sail along-side dolphins, watch the sunset on the Bay and feel the breeze while our USCG captains show you the sailing lifestyle. We’ll create a personalized gift certificate just for your special sailor wannabe, and email it to you. Credit cards accepted. Give a personalized gift certificate for a sailing adventure. Call or register for details. Photo by SailTime VB Member Bob L.